Wood pallets have recently emerged as a favorite home decor and building material. The trend may be here to stay. Pallet boards have a pleasantly aged appearance even when new, and they are often free, or very inexpensive. Lightweight and thin enough to pass as veneer material, pallet boards are easy to work with and are design-flexible, finding their way on everything from fireplace mantels to wall planking to garden planters. But when pallets are difficult to obtain or when their provenance is uncertain, the cheap-and-easy equation begins to break down. Learn how to avoid common pitfalls and score the best pallets for making those fantastic projects you've been dreaming about. One quality that defines a great pallet is whether it is available for the taking. Not all pallets that look available are available. As long as a pallet is on private property, you cannot assume that it is fair game. With the rise of pallets as a favored building material, legislation has stepped up to strengthen laws related to pallets, including aggressively prosecuting pallet "takers" and making business owners accountable for pallet record-keeping. Businesses, more often than not, are required to return pallets. A type of rental system called pallet pooling, administered by groups like CHEP and PECO, aims to keep the cycle of pallets flowing. But sometimes there are gaps in the system, and this is where you can benefit. Not all pallets may be part of a pool. Pallet end-consumers may pay deposit fees but fail to return the pallet to collect the deposit. There are a myriad of ways that excess pallets can collect at businesses, taking up valuable space that owners would like to have back. To combat pallet clutter, your local municipal solid waste authority may maintain a list of commercial recyclers that accept pallets. Begin there or search the web for pallet recyclers in your area. Call the recycling facility prior to visiting to gauge their interest in parting with pallets, as well as their supply of pallets. You will find a treasure trove of available pallets in the Free sub-section of your local Craigslist's For Sale section. Some owners gladly give them away, while others may charge a nominal fee. In many cases, images are attached to the posting, so you'll be able to view the pallets in advance. When something becomes popular, there are always copycats, pallet wood being no exception. Purchasing faux pallet wood circumvents the need to determine if a pallet is legal to take, plus you know that the wood is safe to use. Convenience does come at a cost–between $2.50 and $14 per square foot. Stikwood: As Stikwood is less than 1/4 inch thick, it is best used only as veneer, not structurally. In addition, since it itself is veneer board (a thin layer of hardwood atop thin pine), it can only be used indoors. Cost: $10 to $14/sq. ft. Weathered Hardwood Board: Weathered Hardwood Board brand from Home Depot is as close as you can get to real pallet wood in purchased form. Each pack of eight boards comprises 10.5 sq. ft. and the boards look and feel uncannily like real pallet boards. Because the boards are nearly 1/2" thick and 4' long and are made of solid Appalachian poplar, they can be used either structurally or as a veneer. Cost: about $2.50/sq. ft.
Food-Carrying Pallets: An IPPC (International Plant Protection Convention) "wheat stalk" icon means that the pallet carried food. In 2010, the National Consumers League ran a test of 70 food-carrying wood pallets and found E. coli on 10% and Listeria on 2.9% of them. If you suspect that the pallet carried food, you likely want to avoid it. One exception might be if you intend to use the pallet boards to build a compost bin, as compost piles themselves are veritable factories of microorganisms. Chemically Treated Pallets: Along with the wheat-stalk icon on those food pallets may be the designation "HT" or "MB." HT means that the pallet was heat-treated. "MB" indicates that the pallet was treated with methyl bromide, a neurotoxin and suspected carcinogenic. Petroleum-Stained Pallets: Oil and other petroleum products seep into the cells of wood and are nearly impossible to remove, even with a pressure washer. Paint cannot effectively encapsulate petroleum-stained wood, either. 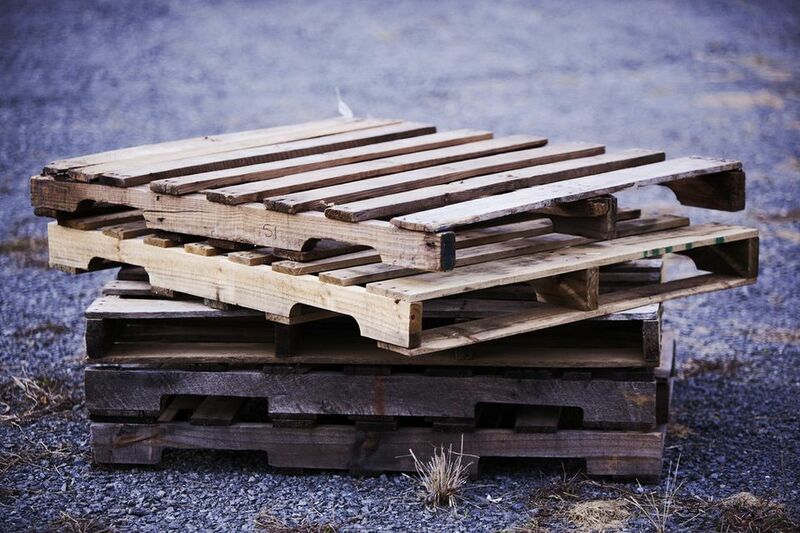 Before you can use your pallet for a project, you need to disassemble it. There are two schools of thought about deconstructing pallets: careful, surgical disassembly vs. cutting them apart. A specialized device that works like a giant clawhammer is the fastest, safest way to disassemble a pallet without breaking boards. Tools like Pallet Paw, Vestil Pallet Buster, and Deck Wrecker have a short, flat fork that slides under the pallet board and a back section that acts like a fulcrum. Most devices come with a handle, but others, like Pallet Buster, require you to supply your own steel pipe as a handle. The beauty of these devices is that the long handles provide exponentially greater force than a mere crowbar. Any nails remaining in the pallet boards can be pounded out from the back side with an ordinary hammer. There are two ways to slice the pallet boards off of the 2x4 stringers: cutting the wood or cutting the nails. Cutting the Wood: This is an easy method, but you do sacrifice about two inches of pallet board at each end. With a circular or reciprocating saw, cut a straight line all the way across the boards, as close as possible to the side 2x4 stringer. After you have cut both the left and right sides, the final step is to pry the pallet board off of the center stringer 2x4. This can be difficult, as the pallet boards may resist your efforts and begin to crack instead. Using a flat pry bar like a Wonderbar allows you to slide far under the pallet board and obtain maximum leverage. Cutting the Nails: Many hobbyists recommend fitting your reciprocating saw with a blade designed for cutting metal, then cutting off the nails that secure the pallet boards to the stringers. This preserves all of the wood in the pallet boards and greatly minimizes splitting. The downside is that nail heads remain in the wood. Some designers keep the nail heads in place as a desired visual element, while others recommend tapping them out from the back side. Purchasing a cheap, sturdy item called a nail set is your best bet. In a pinch, you can use another nail or an old drill bit.